Symbology seems very ordinary. It can be, but it can also be a very powerful energetic tool. When we think of symbols, we think of pictures, shapes, logos, signs, etc. that are representative of something. We are accustomed to using symbology in daily life. The written language is a symbolic language, a means to communicate. Numbers are symbols of energy that we use to calculate, sort, determine and discover. We use signs to let us know what to do and where to go. We have assigned meanings to shapes and pictures for communication and recognition and to let us know the 'value' of something. A rose signifies love. The color of the rose gives more information, i.e., red is for passion or romantic love, yellow is for friendship or congratulations, white is for purity, innocence and respect, and pink is for affection. 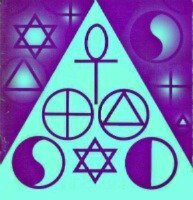 Symbols get their power through the energy they represent. They are energetic particles arranged into specific patterns which carry the essence of that energy within them. Objects can also be imbued with certain energies. When we assign 'meanings' to symbols like numbers or colors, it is the energetic quality that we are describing. The fact that energy has an effect, means that we can use their specific energies to create an effect in our lives. We are affected by the symbology surrounding us everyday. Whether it carries a certain energetic substance, or represents an idea or circumstance, it has an effect on our lives. A depressing picture in your house can bring depressing energy to your life. It is like a subliminal message that your subconscious mind registers every time you see it. You may not even notice it, but your subconscious does. It then builds an image which is reinforced by each subsequent viewing. This builds a thoughtform or belief within the inner self, allowing the formation of the energy to manifest. Avoid art that has any negative connotation. Surround yourself with positive images. Feed your mind well. Symbols are alive with energy. This was shown to me in meditation. In one instance, I found myself inside the apex of a pyramid. There was a thick wooden table in the room filled with fruit. I saw a row of 'beings' that looked sort of like upside-down ankhs, but not. They were living symbols. I knew they had consciousness. They filled me with pure love. I felt it consume me, it was a powerful sensation, it's a love you seldom experience on Earth, a spiritually pure love. It blew me away! In another meditation, I was shown a series of symbols. One by one the images appeared. Each time, I was instructed to "meld" with the image. The melding process was to focus on the image and 'enter' it by becoming one with it. Once this occurred, the next one would pop up. This continued through several symbols, then suddenly I was in a desert, standing on a massive ramp leading to a huge domed craft. There were other people scattered around. As I approached, I recognized a being who was standing close to the door. It felt like we were old friends and I knew him very well. We were happy to see each other. He acted as though he was waiting for me and told me to go on in. I was seated in front of a control panel. There were windows surrounding the circular room. That was the last thing I remembered. When I came out of it, I felt angry. I figured that I was either angry because I wasn't allowed to remember, or, I was shown something that I didn't like. These two experiences made a strong impression on me about the power of symbology. I realized that there is more to their potential than just as a sign or indicator. As all energy is alive and all life is energetic, symbols can be potent tools for our use due to their energetic essence. Not only can they tell a story, they can create a story. Some symbols are universal. We all recognize that water represents life, fire is warmth, and a heart signifies love. Even our facial expressions are symbolic of our thoughts and feelings. Ancient symbols resonate deeply within us, at the soul level, tugging at the ancient memories and knowledge stored there, allowing us to draw from this storehouse when needed. It is always there, a part of us, waiting to be awakened again so that we may manifest these power forms in the Earth's field as conditions and tools of enlightenment.